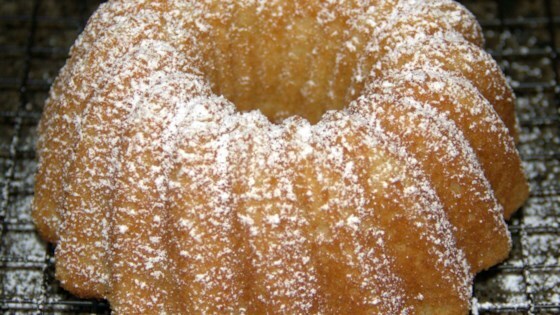 "This is a basic butter cake; the trickiest bit was finding a cake tin to fit in the air fryer. I went with a ring tin, which works really well and makes it cook even quicker. Top with confectioners' sugar." Preheat an air fryer to 350 degrees F (180 degrees C). Spray a small fluted tube pan with cooking spray. Beat butter and 1/4 cup plus 2 tablespoons butter together in a bowl using an electric mixer until light and creamy. Add egg and mix until smooth and fluffy. Stir in flour and salt. Add milk and mix batter thoroughly. Transfer batter to the prepared pan; use the back of a spoon to level the surface. Place the pan in the air fryer basket. Set the timer for 15 minutes. Bake until a toothpick inserted into the cake comes out clean. Turn cake out of pan and allow to cool, about 5 minutes. A classic butter cake – but air-fried! If you don't have an air fryer, this recipe works well in a toaster oven or normal oven. Add 5 minutes to the cook time.